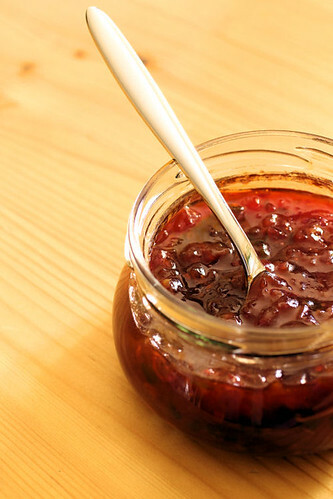 One of my favourite ways to use up chillies is to make a spicy jam with them. I found a great recipe, really easy and so much better than the shop bought stuff. 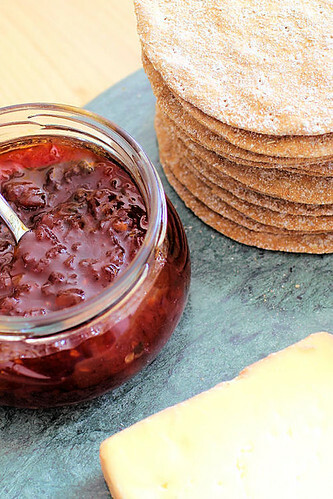 The jam is the perfect accompaniment to a good cheeseboard, but remember not to go overboard with too many chillies to start with, especially if they're really hot ones! 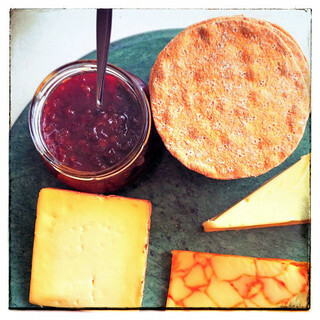 Here's my chilli jam and cheeseboard, plus some wonderful Swedish artisan crispbreads that I won from Peter's Yard in a Twitter competition. 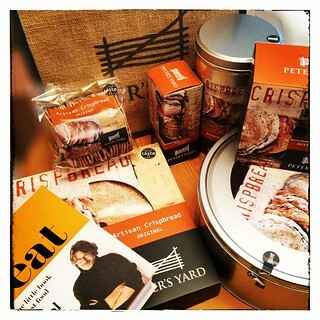 I was sent an amazing box of their crispbreads in varying sizes (some are a whopping 25cm), along with a great book called Eat by Nigel Slater. I've bought the crispbreads before (Waitrose sell them) and would definitely recommend them for a cheeseboard as they are so light, crisp and different - with a great flavour that doesn't detract from the cheese. We all love them! Tornegus - a Caerphilly cheese with the rind washed in Kent wine and herb solution, then sprinkled with lemon verbena. Chilli Sussex Marble - a semi soft cheese with chilli (obviously!) that is medium hot with a little after-kick. Sussex Crumble - a creamy cheese with a slight tang, it's soft and melting in the mouth and not crumbly at all! Adapted from The Boy Can Cook. Note - adjust the amount chillies to your taste! The original recipe uses a pinch of cinnamon, but I preferred to omit it for this recipe. Put the olive oil into a small saucepan and heat over a low to medium heat. Add the onions and gently cook them for about 10 minutes until softened but not brown. Add the garlic and chillies and cook for another 5 minutes. Stir in the tomato purée and add the bay leaf, stirring for another minute. Add the red wine vinegar and the sugar, then season with salt and pepper. Turn the heat to low and leave to cook for about 40-45 minutes, stirring occasionally to make sure it doesn't catch on the bottom of the pan. It should be thick and have a jam-like consistency. Pour into a sterilised jar and, if you can, leave it for a couple of days before using. After opening keep the jam in the fridge. 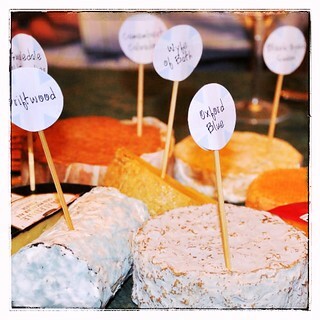 For the Peter's Yard Twitter competition we had to tweet/send a photo of our favourite cheeseboard & here's mine - a good end to a party that we had!